Many think a Handicap or Asian Handicap bet type is too exotic for their blood. Although in reality this is a very simple betting market with a lot of flexibility to suit how much risk vs reward you want in your wagers. Through online betting handicap markets are now widely offered for a huge range of sports. In basic terms these bets do what the name suggests, they offer points handicaps on results in order to increase or decrease the odds for a given outcome. For this reason they are commonly used to even up the odds in contests where there are strong favourites. A straightforward win-lose-draw bet is decided on the actual score in the game. With handicap betting it’s a little bit different. You can choose a team to win on a -1 goal handicap and get better odds than for them to just win the match under normal circumstances. Of course the team would have to then win by two clear goals for your bet to win (2-0, 3-1, etc). 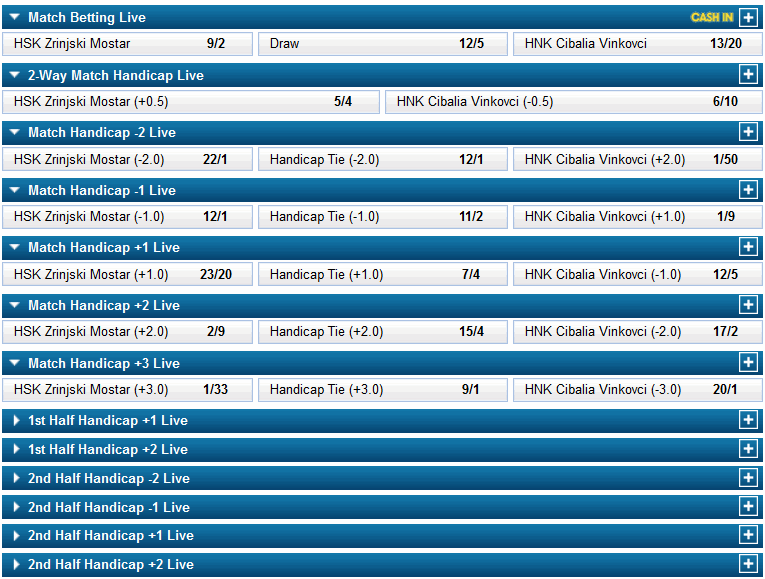 Handicap betting is generally most popular when the favourite is priced up at prohibitive odds. This can happen in football tournaments, such as the Champions League or World Cup, when a top team takes on a much lower ranked opponent. Thanks to the handicap betting the one-sided contest can suddenly becomes a lot more exciting. An odds on favourite may be 1/12 to win a game (such as Barcelona in the screenshot above), perhaps shorter than that. Placing a bet on a straight Barcelona win isn’t going to win you a fortune, £1 for every £12 bet, and it is also a huge risk to stake so much with so little return. Therefore for many in this scenario it is handicap time. 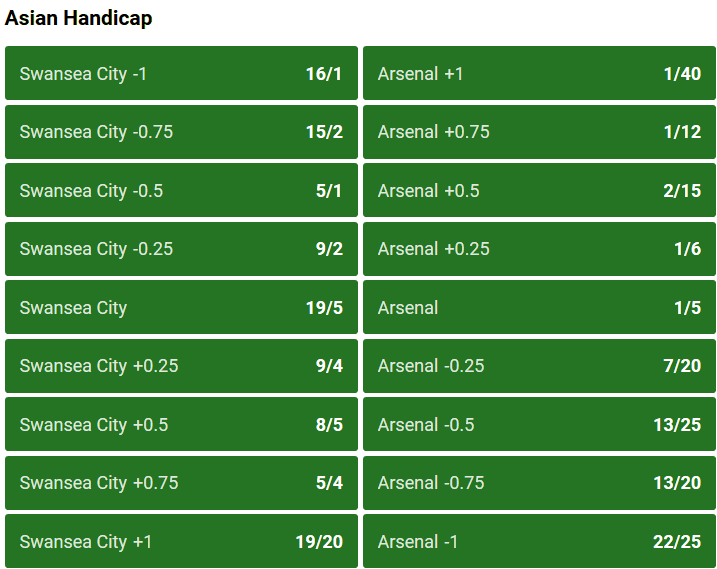 There’s a range of handicap options available, you might decide for the favourites to win on a -3 goal handicap. That means the outsiders (Espanyol in this case) are given a three goal start in the game. For your selection to win they have to finish the game three goals clear of their opponents. With a -3 handicap however the odds are be a lot better, in this case 17/10, so for every £10 bet you will now win £17. Of course you don’t have to go for a handicap win. You could put the favourites on a -3 goal handicap and bet on the match to end in a draw. This would mean for your bet to be a winner Barcelona would have to win by exactly three goals, thus creating a draw for the handicap. It is rare for outsiders to win, this is reflected in the standard odds, in this case 22/1 on Espanyol to beat Barcelona. You may fancy this shock result and take a punt but in reality the bet will rarely yield a return. What you might fancy however is Espanyol to have a decent game, the may perhaps still lose but you think that it won’t be a hammering, maybe Barcelona will only win by one goal. 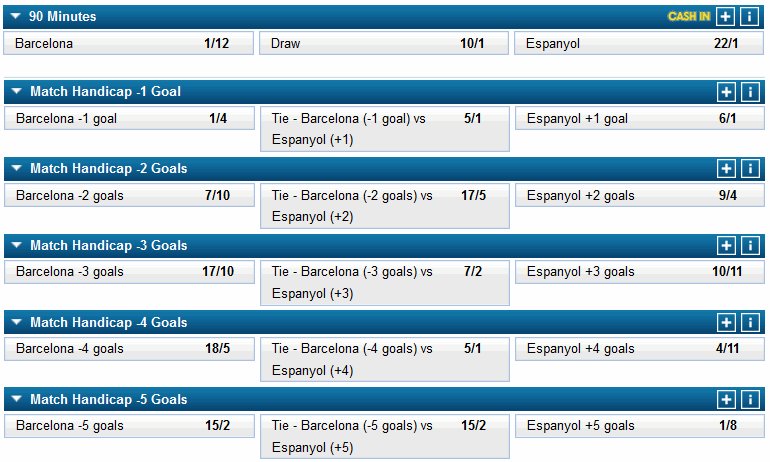 You could therefore back Espanyol with a +2 goal handicap. In this scenario if Barcelona only win by one goal then your bet still wins. The odds for this handicap have decreased from 22/1 to 9/4, but this is still over 2/1 and will give you a good return if it were to happen. Alternatively you may think Barcelona won’t win by more than two goals so you could bet on the draw with Espanyol with a +2 handicap (or indeed Barcelona with a -2 handicap), in this case the draw odds decrease from 10/1 to 17/5. You will need Barcelona to win by exactly two goals to win this bet. When the odds are much closer between the two sides then handicap betting become even more risky but can add more fun to your bets by lengthening the odds. Looking at the example in the screenshot above West Brom are at home to Southampton, the home side are 7/4 and the away side is also 7/4, with 2/1 for a draw. If you think either team can win by more than one goal then all of a sudden deciding to go down the handicap betting route will really increase the odds. West Brom to win on a -1 handicap (therefore having to win by two clear goals to give you a winning bet) will increase their odds to a much more attractive 5/1. Conversely if you think the away side are going to romp home then a -1 handicap on them is also worth 5/1. Handicap markets are good for maintaining your interest in the game throughout the match. You’ll be hoping for another goal, however late, to get you that handicap win or praying the other side doesn’t score to ruin your winning bet. Handicap wins are also not dependent on the real result so let’s say you don’t like betting on Man United to win but you think they are going to win 1-0, you could bet on the opposing team to win with a +2 goal handicap. This way even if United win, and you are not happy, your bet wins, so you are happy. Be careful with this kind of bet though. Higher odds represent higher risk and of course while this is part of the enjoyment don’t expect +/- four or five goal handicaps to come in very often, even for big favourites. The main rule you need to be aware of with this bet is it’s only the standard 90 minutes of the game that counts, in football, Or the standard game time in other sports. If you’ve gone for Manchester City to beat Dynamo Kiev on a -1 handicap and the game is 1-1 after 90 minutes because that means City will have failed to win on the handicap. It doesn’t matter at all that City might go on and win 4-1 after extra time. The arrival of In Play Betting means lots more chances to bet on handicaps. As the game progresses the odds for handicaps will be continually fluctuating. If you’ve got for the favourites to win on a -1 handicap, the longer the game remains level, the odds on them winning on that handicap will lengthen. See a shock goal go in and the odds really will lengthen as the favourites will now need to score three times for that bet to come in. Of course the odds on the outsiders will keep on shortening as the chances of the favourites winning on a handicap look less and less likely. It is possible to bet on handicaps for the entire game result or just one half. If betting on tennis, for example, you could bet on handicaps for the entire match result or just one set, etc. It’s obviously not just football where handicap betting is popular. It’s almost a way of life in some sports such as American Football, Rugby Union and Rugby League. Particularly in Rugby Union and League there will be plenty of games where you just can’t bet on a team to win outright. The odds will be really short so again you have to go down the handicap route to try and find some decent odds with which to play. This is extremely common in international fixtures, say a game between New Zealand and Canada. You can go for the All-Blacks to win on a -40 handicap and just watch the points mount up and hope you’ll be on a winner. Tennis is another great sport for handicap betting, by the match or set. With some bookies you can get handicaps for individual games! Basically any sport where there is either a score kept or time then you can handicap the market. You can handicap a race by adding or removing time, you can handicap a golf player by adding or removing shots, handicap a plotical election by adding or removing seats, etc. In fact I can’t think of a sport where you couldn’t handicap at least one market. Part of the difficulty is finding the markets. Bigger bookies, the likes of William Hill (used for the screenshots on this page), Ladbrokes, Coral, Betfred, Unibet, etc., are going to be more likely than other to have the markets you are looking for. Quite often for more obscure events or sports if you want to back handicap lines you may need to contact the betting site and ask for markets. Most are happy to do this, just give yourself plenty of time. This has become a popular bet in recent years but how does it differ from the handicap betting we have already taken a look at? The main difference is that there’s no draw available with Asian Handicaps. How is that possible? Well rather than a -3 handicap it might be a -2.5 handicap. That means the favourites would have to win by three clear goals to get the win. If they win by two then the bet goes down, the addition of 0.5 into the bet means a draw simply can’t happen so the bet will simply be on whether the favourites or the outsiders win the game on the handicap. 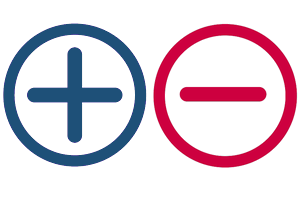 There’s also what is known as split, double or quarter Asian Handicap betting where the wager you make is split into two. The home side may have handicaps of +1.0 and +1.5, if they win by two goals then you’re on a winner, if they win by a single goal you lose half your bet stake as one of the handicaps (1.0) is a winner while the other (1.5) is a loser. This is kind of like a half-insurance bet and is written as either two numbers (+1.0/1.5) or as a quarter number (+1.75). Asian handicaps are less commonly available than handicaps. Again you need to pick a bigger betting site (such as Unibet used for the screenshot example above) or ask for a market in advance. As with other bets there are plenty of coupons available for you to bet on. This lists all the games being played but with handicap betting odds. Here you can bet on a number of matches with handicaps set so you can bet on two, three, four or more selections and build up some decent odds. Most coupons, such as the one shown in the example above for a selection of Rugby Super League matches, are used to even up the odds over a range of games. You will notice the handicaps range from -2 to -12 depending on the game. These are available at the start of the league season and can produce some good wins. The league favourites will start on what is called ‘scratch’, the other teams will be given a handicap mark relative to them. For example, the second favourites may be given a two point start on the favourites. The less likely the bookmakers think a team are likely to win the league, the higher their handicap will be. At the end of the season, all the teams’ handicap scores are added to the actual number of points they managed to get. The team with the most points are then declared the winner. You can either have a win bet of each-way bet here. Anyone betting on Leicester on a handicap in the 2014/15 Premier League season really would have been laughing all the way to the bank. They started the season with a large handicap figure and no one ever imagined they’d rack up the number of points they did. The screenshot above is from Coral and shows the initial handicap given and final results from that handicap in the 2014/15 premier league season when Chelsea won the league with 87 points. 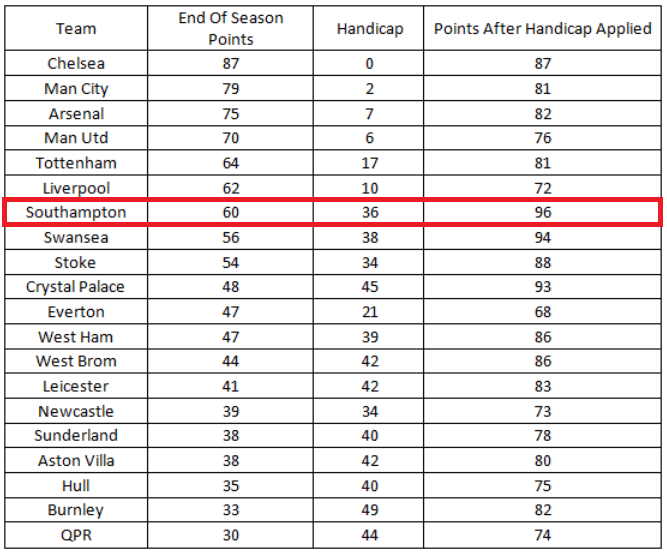 In this example however the handicap league was actually won by Southampton, with 60 real points and a 36 point handicap, giving a total of 96 points. It’s always good to be able to get some decent odds on the team you want to win. If your selection is heavily odds on then that will put you off betting on them. The handicap system creates a more exciting game and supplies the punter with much more attractive odds. It also keeps your interest in a game going throughout the match.